By contrast, the Wellcome’s show of ex-voto panels from Mexico, the small thanks-offerings painted to record miraculous intercessions from the saints in the daily lives of ordinary people, has remained with me, images popping up in my mind at surprising moments: touching, funny, heart-breaking and above all fascinating. On the dance front, two performances stand out, one for its choreography, one for a performer. The Mariinsky danced Balanchine’s Scotch Symphony on their summer visit. Lots of the critics didn’t engage with it, but to me it was a miracle of Romantic gossamer, seen through a sharp neo-classical prism. (Right, Alina Somova and Aleksandr Sergeyev, photo Natasha Razina/Mariinsky) That sounds overly intellectualised, but I felt like a child at her first ballet when watching, it was all so new and fresh. And Alina Cojocaru danced Manon as though it too were newly made. I’m told that there was a lot of backstage flak for her – it is true, not every step was performed exactly as choreographed by Kenneth MacMillan. But my god, the spirit was MacMillan’s, and the emotional power. It was one of the greatest tours de force I have ever seen. 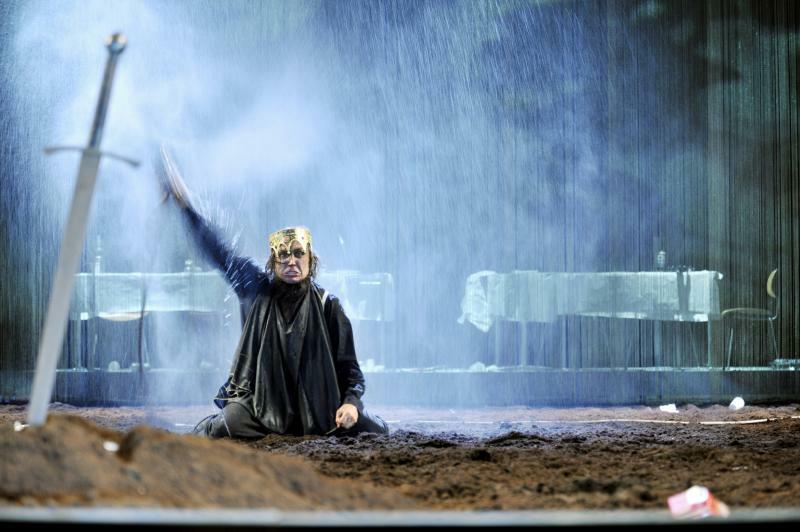 And finally, the Schaubühne Berlin brought their version of Hamlet, adapted by Marius von Mayenburg. It began with “To be or not to be”, which was repeated like an echo twice more in the evening. Hamlet (Lars Eidinger, left, photo Arno Declair) not only switched in a heartbeat from comic to tragic, but even from fat to thin (one of the more bizarre shocks of the evening). As a non-German-speaker, it was clear I and the other Anglos in the audience were having a different experience from the Germans, who were hearing a modernised text while we were reading 16th-century English in surtitles. If I’d had to change anything, I would have asked for a direct translation of what was being said. But what remains in my head weeks later is the design, by Jan Pappelbaum, who created a large square of earth, soon churned up to mud. Here, Hamlet’s conviction that the world is made up of betrayal, manipulation and deceit in the pursuit of power could not be more graphically displayed. Ultimately we are all sliding around in the mud, the world is the pit of slime that Hamlet sees in his madness. Or perhaps, in his sanity. 2011 highlight: Anne Teresa de Keersmaeker’s Bartok/Mikrokosmos was both tender and a joyous stomp. 2011 letdown: A toss-up. ENB’s Strictly Gershwin made me want to slash my wrists, just to alleviate the boredom, but Rambert’s Cardoon Club, overproduced and overlong, was perhaps worse, because it was paired with the almost perfect Paul Taylor Roses. 2012 recommendation: Theatre: Ninagawa Cymbeline (I’m not a Cymbers type of girl, but I’m a passionate fan of this Japanese director) and the Chichester Sweeney Todd, with the fabulous Imelda Staunton. Dance: the Royal Ballet’s Les Noces – my desert island ballet and score. This entry was posted in Journalism and tagged Published, The Arts Desk by inspectorbucket. Bookmark the permalink.